Goshen College already experienced its first reported case of textbook theft this fall, proving that, like every other school, it is not immune to this type of crime. Linda Schlabach Miller, bookstore manager, said these thefts started getting reported last spring, but doesn’t know whether there were unreported crimes before that. There were about six cases last spring, with only one so far this year. In this fall’s incident, the books were recovered and the culprit was identified, although this is not always the case. 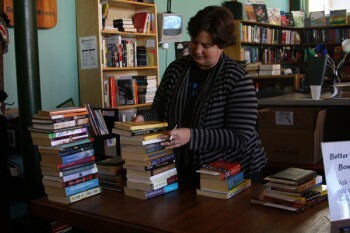 “Once a book is stolen, it’s really hard to recover it,” said Schlabach Miller. The likelihood of finding the book and getting it back is much higher the sooner it is reported. As soon as a person realizes that they have been robbed, he or she should report the loss to the campus bookstore and also to the Student Life office. This way, the bookstore can alert other local and regional bookstores to be on the lookout for stolen copies of this particular book. To assist students who find themselves victims of textbook theft, Schlabach Miller met with a loss prevention officer to discuss strategies for prevention and recovery. One useful preventative measure is to put a small personal mark-such as a star or other icon-on a certain page of every textbook you own, she said. This allows for quick identification of stolen property by booksellers who have received the alert. The most obvious advice could be the most useful: lock your room when you aren’t there and don’t leave textbooks unattended, said Schlabach Miller. She implored students to take this nation-wide crime seriously for their own benefit. “Our biggest concern is that students have the books that they need in order to study,” she said.